Yogesh Chabria - The Happionaire ​Blog - Best Motivational Speakers In India - Inspiration, Success: Let Us All Meet! I assure you that it is going to be loads of fun and I’m sure you will get to learn something new. I'm also going to share a few interesting secrets that can help you invest better and maybe even a few details about my investments. It is going to be incredible meeting all of you and I’m sure I will get to learn a lot from you. Do make it a point to get your friends and family along. I hope to see you soon and I guarantee you that it will be something you remember for the rest of your life. For all of you who aren't in Mumbai, I'm sure in the future we would be having events in your city too. Keep watching this space for more! Read what Sonu, a fellow Happionaire had to say about our last post here! I wish I could meet you Yogesh! I have really wanted to meet you and get my book signed by you. WOW ITHW is just moving up the bestseller list! This is great news.......and I shall surely be there to catch up with all fellow Happionaires! It is really going to be a first for me to have my book signed by a bestselling author. See you and smiles :-) !!!!! My "WOW"s to what you just said Kabir. 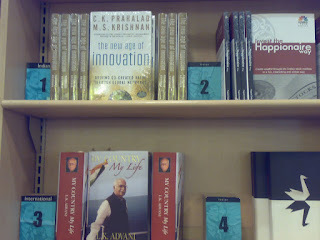 It is great that book has moved up the bestseller list so fast without even any major marketing. I am very very happy that so many people are learning the right things not just of investing but also life. Yogesh for me is much more than somebody who just writes on investing and invests. He is doing great by spreading smiles, love and peace. Great idea and thanks for letting us all meet you Yogesh. I shall surely be there! Congratulations once again for ruling the bestseller list so fast. Wish I could make it to the event, I'm based in London. Have fun! I shared the book with friends at my fund. They loved the simple nature of it and also the fact that it is very touching to the heart. A book that can be read over and over again when markets are not in the best of shape. It deserves to be on Number 1! It will happen soon, I'm sure. As you know I'm not in India so wouldn't be able to make it, but would have really loved to come. Will surely be there and bring all my friends along!! Yogesh I was really interested in your blogs as I liked your idea of investing the happionaire way.. wanted to learn something from an avid investor like you... I really liked your initial articles where you talked about Rakesh, Mukesh, Warren and how to keep cool etc. But, I really want to say that from last 4-5 blog posts I have started losing interest in this post as it seems to be only limited to promoting your book ITHW. I really feel in a blog like this, promoting your book or announcing success of book should be a footnote or a sidenote in an article rather than dedicating the articles just for it.. I hope you will take this in positive sense and will start writing some useful posts again..
Nice to see so much happening. I'm sure things must be very hectic on your end. Looking forward to you coming to Hyderabad too! That is great new Yogesh. Will surely try to attend. Sood I think Yogesh is simply sharing what all things are happening with ITHW. I can surely understand how exciting it must be for him to see his book move up the list as a first time author. :-) I don't think the book needs more promotion and he is just sharing what is happening with us. And as he says this blog isn't just about investing and lots of the basics according to me have been shared. Hope you enjoy your holiday in New York Sameera. I hope I get to meet you too Vivek and the several other Happionaires in Bangalore. I agree with you Nitin that the past few posts have been about ITHW and it is really sweet of you to point it out so that we can always help improve the blog and write what our fellow Happionaires want. However since the book is very special and close to my heart. Almost like my child and just like parents would like to share about their child coming first in class with their family, I like sharing details about our book with members of the Happionaire family here. It is really good to see how modest and humble you are. I'm sure Nitin must be smiling. I understand what you mean Yogesh. When my baby boy came first in KG and got a gold star, I showed it to all my friends and family for almost a week. I will surely miss attending the event. It would be a great way to just meet and interact and spread love. Nothing to apologize about Yogesh :-) it is really great that you are sharing whatever is happening in the Happionaire world with us and are also so humble enough to thank us for your own hard work and ideas. We need to spread this mentality to everybody in the world. That people who are nice, humble and polite can succeed too. You don't have to be mean in this world to get ahead. Very inspiring and motivating to see the success in front of my own eyes. 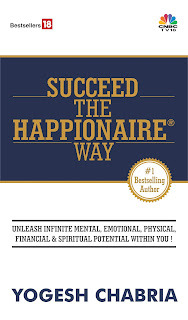 A few months ago the Happionaire way didn't even exist, but today it is spreading so fast all over the world thanks to your initiatives and hard work. May everybody smile and be happy. Great idea Yogesh. I would love to attend your workshop but it would be difficult to attend for an outsider. I recently purchased your book online and loving it! I hope you would share your workshop on blog as well. Abhishek, you mean you are not in Bombay. :-) Hopefully we will be visiting more cities and after that I will be sharing interesting details about it. Lots of new things are planned. Will share them soon.